خلیلی, کیوان, ناظری تهرودی, محمد. (1395). ارزیابی مدل‌های تک متغیره و چندمتغیره سری‌های زمانی در پیش‌بینی تراز سطح آب دریاچه ارومیه. نشریه آبیاری و زهکشی ایران, 10(2), 145-155. 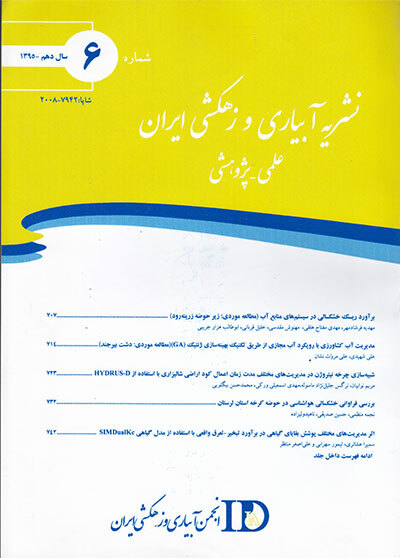 کیوان خلیلی; محمد ناظری تهرودی. "ارزیابی مدل‌های تک متغیره و چندمتغیره سری‌های زمانی در پیش‌بینی تراز سطح آب دریاچه ارومیه". نشریه آبیاری و زهکشی ایران, 10, 2, 1395, 145-155. خلیلی, کیوان, ناظری تهرودی, محمد. (1395). 'ارزیابی مدل‌های تک متغیره و چندمتغیره سری‌های زمانی در پیش‌بینی تراز سطح آب دریاچه ارومیه', نشریه آبیاری و زهکشی ایران, 10(2), pp. 145-155. خلیلی, کیوان, ناظری تهرودی, محمد. ارزیابی مدل‌های تک متغیره و چندمتغیره سری‌های زمانی در پیش‌بینی تراز سطح آب دریاچه ارومیه. نشریه آبیاری و زهکشی ایران, 1395; 10(2): 145-155. بیش از سه دهه است که هیدرولوژیست­ها، استفاده از مدل­های چندمتغیره را جهت توصیف و مدل­سازی داده­های پیچیده هیدرولوژی توصیه می­کنند. درحالی­که به تازگی اهمیت مدل­های چند­متغیره در مهندسی آب مطرح شده است. در واقع در مدل­های چند­متغیره با دخالت دادن عوامل مؤثر دیگر، می­توان نتایج توصیف، مدل­سازی و پیش­بینی پارامترهای مختلف را بهبود بخشید. در این مطالعه، مدل­های تک متغیره آرما و چند­متغیره همزمان آرما (کارما) جهت مدل­سازی تراز سطح آب دریاچه ارومیه مورد ارزیابی قرار گرفتند. جهت استفاده از مدل­های آرما، از سری زمانی تراز سطح آب دریاچه ارومیه در مقیاس سالانه در طی دوره آماری (1390-1361) و جهت مدل­سازی با استفاده از مدل­های کارما، از سری زمانی دبی رودخانه­های شهرچای، نازلوچای و باراندوزچای و تراز سطح آب دریاچه ارومیه در دوره آماری ذکر شده استفاده شد. نتایج بررسی و صحت­سنجی مدل­ها نشان داد که با دخالت دادن دبی رودخانه­های ذکر شده، دقت مدل­سازی و صحت­سنجی مدل­ها افزایش پیدا خواهد کرد. هم­چنین نتایج نشان داد که به ازای ضریب تبیین 75/0 بین داده­های صحت­سنجی مدل­ها و معیار جذر میانگین مربعات خطا (62/0)، مدل کارما نتایج بهتری از مدل آرما ارایهمی­نماید. به­طوریکه استفاده از مدل چندمتغیره در مدل­سازی و پیش­بینی تراز سطح آب دریاچه، دقت مدل­سازی داده­های مورد استفاده را در دوره آماری 1390-1361 و در مقیاس سالانه در دو مرحله آموزش و صحت­سنجی حدود 20 درصد افزایش داد. For over three decades, hydrologists were recommended multivariate models to describe and modeling complex hydrological processes. While recently the multivariate models in hydrology is discussed. In multivariate models, the modeling and predicting various parameters can be improved by involving other factors. In this study, univariate and contemporaneous multivariate ARMA models (CARMA) were evaluated for modeling of Urmia lake water level. The time series of Urmia Lake water level in annual scale in the period of 1982-2011 were used for ARMA models and the time series of Shahrchai, Nazloochai and Barandoozchai flow rates and Urmia Lake water level in mentioned data period were used for CARMA models. The results of evaluation and verification of models showed that by adding river flow data, the accuracy of modeling and verification of models will increase. Also the results showed that according to R-square coefficient equal to 0.75 between validation data of models and the root mean square error criterion equal to 0.62, the CARMA models can provide better results than ARMA models. Using multivariate models in the modeling and forecasting of Urmia lake water level increased the accuracy of modeling about 20 percent. Box,G.E and Jenkins,G.M. 1976. Time series analysis. Forecasting and Control, San Francisco: Holden-Day. Camacho,F and Mcleod,I.A. 1987. Multivariate contemporanrous ARMA model with hydrological applications. Journal of Stochastic Hydrology and Hydraulics. 1: 141-154. Camacho,F., Mcleod,I.AandHipet,K.W. 1985. Contemporanrous autoregressive moving average (CARMA) modeling in water resources. American water resources association. 21(4): 709-720. Fiering,M.B. 1964. Multivariate techniques for synthetic hydrology. Journal of hydrology. 90.5: 43-60. Kendall,M.G. 1938. A new measure of rank correlation. Biometrika. 36: 81-93. Khalili,K., NazeriTahrudi,M., AbbaszadehAfshar,M and NazeriTahrudi,Z. 2014. Modeling Monthly Mean Air Temperature Using SAMS2007 (Case Study: Urmia synoptic station). Journal of Middle East Applied Science and Technology. 15: 578-583. Khalili,K., Tahoudi,M.NMirabbasi,R and Ahmadi,F. 2015. Investigation of spatial and temporal variability of precipitation in Iran over last half century. Stochastic Environmental Research and Risk Assessment. 4: 1-17. Matalas,N.C. 1967. Mathematical assessment of synthetic hydrology. Journal of Water Resource. 3. 4:937-945. Matalas,N.C and Wallis,J.R. 1971. Statistical properties of multivariate fractional noise processes. Journal of water resource. 3.4: 1460-1468. Mejia,J.M. 1971. On the generation of multivariate sequences exhibiting the Hurst phenomenon and some state university, Fort Colins, Colorado. Mendenhall,W and Reinmuth, J. 1982. Statistics for Management and Ecomonics, Fourth Edition, Duxbury Press. O'Connel,P.E. 1974. Stochastic modeling of long-term persistence in stream flow sequences. Ph.D, Thesis. Imperial College, University of London. Salas,J.D., Delleur,J.W., Yevjevich,V and Lane,W.L. 1980. Applied Modeling of hydrologic Time Series. Water resource Publications, P. O. Box 2841. Littleton, Colorado .80161, U.S.A. 484 Papers. Valencia,D and Schaake,J.C. 1973. Disaggregation processes in stochastic hydrology. Journal of water resource. 9. 3: 580-585. Young,G.D and Pisano,W.C. 1968. Operational hydrology using residuals. Journal of hydrology. 944: 909-923.